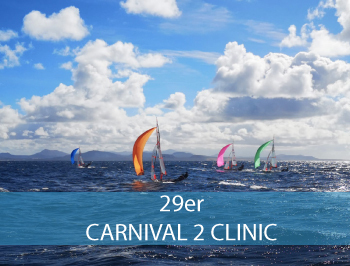 29er – Carnival 2 Clinic | Dinghycoach 25 Feb Clinic day 1 26 Feb Clinic day 2 27 Feb Clinic day 3 28 Feb Clinic day 4 1 Mar Clinic day 5 2 Mar Clinic day 6/ Departure Daily schedule 09.30h Physical session 10.00h Briefing 11.30h Sailing 15.30h Debriefing Pricing Price to be confirmed. Pricing depends on how many teams join the clinic. If you are interested please contact Diego lanzarote@dinghycoach.com and inquire for prices and interest. Sailors get a choice to book the clinic including accommodation to stay at our hotel or excluding accommodation and arrange their accommodation in a villa through us or elsewhere by yourself.